Chi Gong is a set of meditative exercises developed over 2,000 years ago by Taoist monks in China. By combining simple body movements, breathing and mental imagery you can direct the flow of your body's energy to prevent disease, build strength and to advance spiritually. Qigong practice makes one sensitive to the internal operations of one's body, and it helps to reveal the body's place within nature's oneness. This permits one to build up resistance to imbalances and blockages affecting our qi, which aids the integration of one's yin and yang internal factors within the universal order -- of which we are a part. We may understand qi as the force that integrates the relationship between body (matter, structure) and mind (process, function). In the philosophy of qigong, a primary aim is to maintain or restore balance and harmony within the energy body and therefore, manifest changes in the physical body. Through qigong, one can build up qi and move it to where a disturbance or blockage occurs. Practitioners gain more than improved health. They learn another way of looking at and experiencing the dynamic unity of life, one far removed from the disenchanted and alienated thought-paterns common in Western civilization. 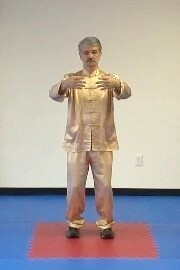 Zhan Zhuang - Tree standing qigong is one of the most commonly practiced methods of qigong in China. Healing Tao - Using a series of ancient meditative and internal energy exercises, one learns to increase physical energy, release tension, improve health, and acquire the ability to heal oneself and others. Grounding - The most important qigong class taught at CHI. 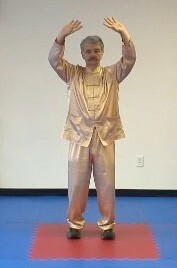 This is the fundamental exercise for most all qigong methods. This is a must for taiji students. Can't Live Stress-Free? You Need More Chi!